If you have not gotten your tools properly installed yet, then DO NOT CONTINUE. Go back to the tool installation page and get that done right first. You also HAVE to have your console enabled. Don't be scared, this is easy! First, open ION Radiant. Go up to the menu along the top of the screen and click on TEXTURES. Select the very last item in the drop-down menu that appears (LOAD FROM LIST...). A list of texture directories will appear... Double click on whichever one you want. Wait a minute for all the textures to load (while they are loading you will see text flash across the pane on the bottom of the screen as each individual texture is loaded up). Once they're ready, the lower right pane will show the topmost available textures in the directory. Placing the pointer in this pane, holding down the right mouse button, and sliding your mouse forward and back will scroll the textures down and up. Left click on whichever texture you want to use. Then move your pointer into the pane in the center of the screen, hold down the left mouse button, and drag the cursor diagonally to create a big square. This is called a brush, and is the basic building block of a Daikatana map. Move your cursor to the leftmost pane, left click and hold on the dark square you see there right by the 0 mark, and drag the pointer upwards in order to increase the thickness of your brush. Then click the hollow button and your big square cube brush will be turned into an empty box (now comprised of SIX brushes... four walls, a cieling, and a floor) covered with whatever texture you originally chose. Next up, hit the ESC key to de-select the brushes. In the center pane and in the center of the box you've drawn there, right click your mouse button to bring up another menu. Click on INFO, then INFO_PlAYER_START. A red square will appear, which serves as the location where you as the player will appear in-game when the map loads. Using your pointer and holding down the left mouse button, you can drag this item (as long as it is highlighted in red, i.e. selected) to wherever you want it EXCEPT OUTSIDE the room you created. It will also be necessary to move your cursor over to the left pane and click and drag the box representing your player start. Drag the red box there two squares up, so that it is above the dark box that represents the room's floor. Hit ESC to deselect your player start. Now you need to add at least one light. Right click in the center pane again, select LIGHT, and then LIGHT again. Check in the leftmost pane again to make sure your light isn't in the floor, cieling, or outside your room altogether. Hit ESC. 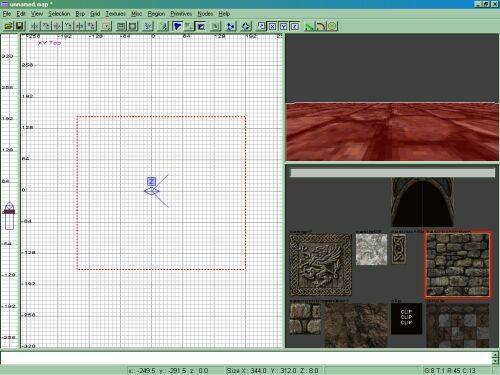 The final step is to setup some basic map information that Daikatana will need to know in order to use the right weapons, etc. Hit the N key, and a window will pop up. In the upper right, use the slider bar to go down to the very bottom and select WORLDSPAWN (click the word once). Then at the bottom, in the field to the right of the word KEY, type palette. In the field below it, type whatever the name of the texture directory you're using is. If you don't remember, hit N again to close the window and scroll through the text in the very bottom window. Somewhere in there you will find text that shows what texture directory you used (e3dm1 for example). Once you've done this, hit N and input the palette info and hit enter. The next step for your worldspawn setup is to type episode in the KEY field and then 1-4 for whatever episode your map is for (hit enter again). Press N to close that window, and your map is done! Go up to the menu, click FILE, then SAVE AS. Pick a filename, click SAVE. Now, outside ION Radiant, click your windows START button and then RUN. Type in the path to the directory you installed the tools into, and compile the map using FAST MAPNAME where MAPNAME is, duh, the name of your map. Carefully watch the DOS window, and if you see any error messages then you pretty much need to start over.